One of the most exciting things that we are starting to see in the world of stoner rock is a shift away from boring songs that drag on for way too long and instead an acceptance of pure roc and roll magic with shorter things and tighter riffs. 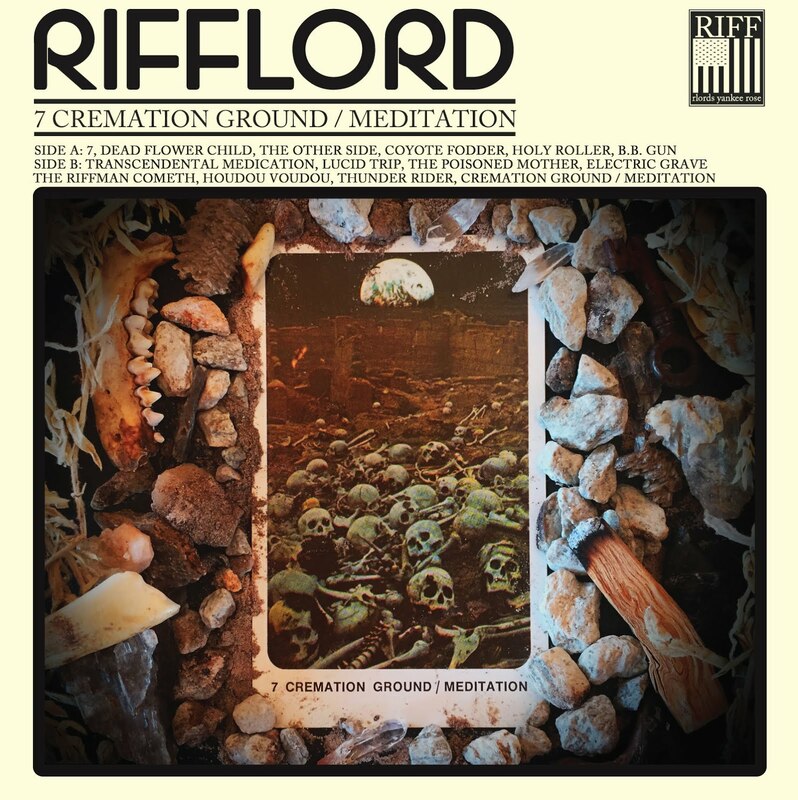 Such his the magic of Rifflord with their first record in eight years, 7 Cremation Ground/Meditation. A band who certainly seem to worship the riff, this is an exciting blend of hard rock stylings into something that is refreshingly direct and wonderfully nostalgic whilst maintain a modern approach. 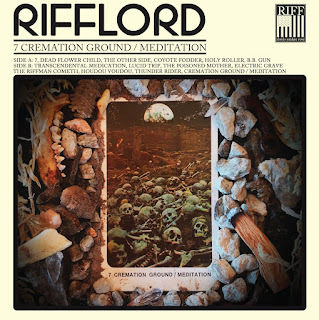 I think what I enjoy about Rifflord isn't jsut their willingness to embrace standard rock and roll tropes, but moreover their ability to push it over the top. The massive chorus on a track like Hou Dou Vou Dou is really fun to listen to and the cry of "Old fashioned black magic!" kind of captures the ethos of the entire record. Tied into this is the simple fact that Rifflord straight up love black Sabbath. They quote the band in their lyrics, they even sample interview clips. It is a really fun little set of throwbacks they've worked in here in a surprisingly tasteful way which makes for some really compelling listen that is guaranteed to leave you with a smile on your face. With this albums thirteen tracks only two trickle over the four minute mark. Think about that. That's a really big deal in a scene that is often plagued by tracks that simply will not end. Rifflord know what they want to say and say it consicely, stomping you in the teeth for good measure. Sure their music may be referential and silly at times, but by god if it isn't great. It's able to pull from a diverse set of influences to ensure that 7 Cremation Ground/Meditation straight up rocks, no ifs, ands or buts about it.